Although it would not be any exaggeration to say that signature drinks are nearly completely unknown when it comes to Polish wedding routine, we believe that they create an excellent opportunity to spread the theme of your reception and surprise your guests with the extraordinary, astonishing details. This is why with this post Bautifulday wedding planners would like to fill the void. At least a little bit. For some of you that may not know the whole idea: a wedding signature drinks & cocktails are a personalized, unique drinks that expresses the nature of the person who designed them. The drink should not just reflect the taste or preferences of the designer but also capture his personality, character and charisma. Above all that, when it comes to the weddings, it suppose to highlight the theme of the event too. Although the signature drinks is not the very basic of every event, they are becoming increasingly more popular and fashionable. We believe they can brilliantly fulfill every high-class reception and give you a marvelous chance to show your guest that you and your wedding planners thought of every single detail of the da. And it can save you some money too! Think about it! The signature cocktails are a perfect replacement for a costly open bar. 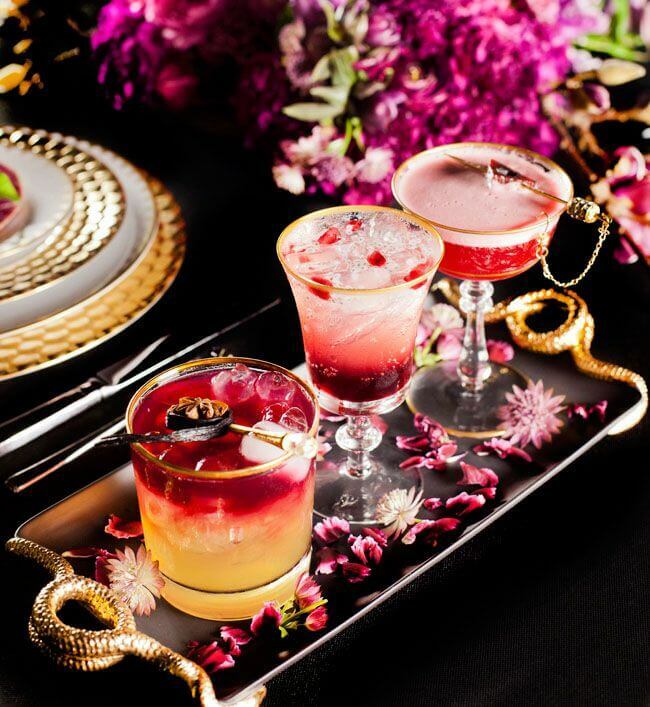 As we all know, the world of cocktails and drinks is so wide, colorful, vibrant and diverse that it would not be possible to express it all with just one glass. For that reason, it’s not very likely to create the one and only, perfect, flawless drink that every guest will fall in love with. But that is not the point. As we said, a signature cocktail should just reflect your wedding day and you both as a couple. It might also be the case that both of you are not really the number one fans of colorful cocktails. Or maybe you are just not passionate about creating the stylish alcohol combinations. If so happens, the easiest and the best solution would be to design your drink so as to emphasize the color palette of your party. The other marvelous hint is to craft a combination that incorporates the local traditions and well-known ingredients, characteristic for the place that you are hosting the event. Plus, you can always choose your alcohol concerning the taste of your beloved ones. Of course, if you are hosting a non-alcoholic wedding, or you know that many of you guest do not drink alcohol, there is no reason why you should not introduce a refreshing, non-alcohol beverage. Contrarily, when your reception guests are quite picky or just diverse, design two or more drinks that will represent your event. In the upcoming post, we will assist you in creating and arranging your signature drinks. For now, please remember – when you are planning the wedding and wondering about all the possibilities that will make your wedding exceptional and unforgettable, take a sec to think about the very unique detail of your big day – a signature drink or a cocktail. They really give you a opportunity to bring out your personality and to stress the theme of your big day. So do follow our blog for future unique inspirations, recipes and designs.